if this in enabled HeidiSQL won't ask anymore to save them. I use those queries for debugging. They are not relevant enough to save them for ever but I'd like them to be there for 1-2 weeks until they aren't relevant anymore. additionally it would be nice to be useful to hit F2 on a query tab to rename it in place (without save file dialog) because Query 1, Query 2, Query 3, Query 4 is hard to tell apart. I also often have multiple Windows open of HeidiSQL. In that case it could check whether ie. Query 1.sql already exists in the %appdata% folder and iterate the number up until there is no file collision. When all HeidiSQL Windows are close and a new instance is started, all those unsaved queries would open again in one instance. This could get messy but I guess there is no way around that. That's the time to tidy up. Thanks for the best SQL-Browser on Windows! %appdata%HeidiSQL\unsaved Queries\[CONNECTION_NAME]\query_*.sql in my case I'm used to have several instances opened but connected to a different DBs. Thank you for your efforts, guys. I really like HeidiSQL, but I'm scared of using it sometimes because it does not backup your work. I vote for this as well. Pretty simple (seemingly) change, but a major enhancement to the user experience! I use Heidi for any MySQL queries I do, and this would be a very nice enhancement. This is a critical feature. I love Heidi and appreciate all great effort, but I would prioritize this over other enhancements. This feature would greatly increase my workflow, since i do not have the time to save every query - but might need them later. Been looking for this as well. My co-worker told me he loves Heidi but this is a feature that is missing and would help him a lot. Hope it gets implemented soon. I am also looking forward for this feature. Will improve my experience a lot. This would also save those who get frequent crashing of HeidiSQL and lose large queries that they were working on. Often when a crash occurs an exception dialog will popup and sometimes clicking on "continue" will actually close the program, or "continue" won't be available. In either case, trying to copy the query out of the tab before closing the exception box is not possible and unsaved queries are lost. Notepad++ also has this feature and it's saved me countless times. Hi @ansgarbecker, since quite a few people would find this useful can you give us an idea whether you have already been working on this or when we can expect this in a nightly version? Of course you have a bunch of other things in your 10.2 milestone. This is not to rush anything, just informational. This is one of the most and longest wish from many users, so it will be one of the next feature I am going to implement. Fantastic news, thanks @ansgarbecker ! So, the approach in Notepad++ is missing the option to ignore unsaved text in a tab without even auto-saving it. In order not to break this old feature of HeidiSQL, I should add a new "Files" tab to the preferences dialog, containing that old "Prompt to save" checkbox. Additionally, we will have a new checkbox like in Notepad++, labelled "Automatically backup unsaved files". This option applies to tabs left open when exiting HeidiSQL, not to closed tabs, in contrast to the Prompt option. And finally I think there is no need to even customize the interval for saving these backups, like in Notepad++. Instead, Heidi should save these temporary files every 10 seconds, and only if content was changed. By the way, is it a good idea to leave out files bigger than let's say 10MB? I'm quite sure such bigger files are normally automatically generated. And it may introduce a performance issue if HeidiSQL e.g. has to save a 5GB file every 10 seconds. 10MB sound way too much I find. 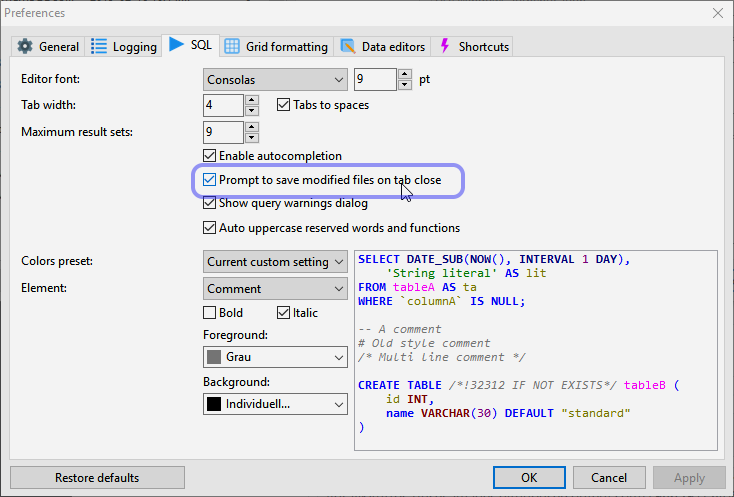 If I export data as SQL and paste it in a tab, then I don't want that saved. 10kb or 100kb would already be very big queries. What about putting the file size as another option if you already create a new settings tab? My limit would likely be around 10kb. Yeah I think 10MB is huge for a file. If you want to go full customization, this can be a configurable field where you set max size in kb. To ensure this feature is done right there should be some forethought about being able to recover from a corrupt cache that prevents HeidiSQL from loading properly, such as a command line option to skip loading background-saved queries, or on launch after a crash give the option to skip loading background saved queries that may be preventing it from starting up. Also, in regards to file size I would assume it would be fairly trivial to compress the queries before saving to disk since SQL text is highly compressible. Very large queries likely have a lot of repeating text and could be reduced in size drastically with most compression algorithms. I would like this feature very much. I would also like some sushi. I would appreciate this feature. The auto-restore feature is activated by default, and can be disabled in Preferences > Files > "Reopen previously used SQL files..."
I think the current implementation is not yet safe against running multiple instances... Please be aware of that if you already use this feature. nothing important should remain unsaved anyway. It can't be worse than before the feature implementation when all the unsaved queries were gone by default. Not really. Previously it was warning about unsaved queries, and wouldn't close until you save or discard them. Will it also be implemented for the portable version? The portable is the same executable as the normal version, it just gets flagged via the portable.lock file. But I suppose your question was meant for the directories, which are not "quite portable". Well I did not see the need for it yet, but it may make sense. In the portable version, the tabs.ini could live in the directory with heidisql.exe, and the "Backups" directory could be auto-created as a subfolder of it. Does that make sense? The "tabs.ini" that was in the same place as the executable heidiSql.exe (as is its configuration), for any of the versions, portable and installable. Read: the first instance restores tabs from the previous one. Second and later instances do not restore tabs, but can add new tabs. This way, no tab content gets lost. If you exit 3 instances with let's say 2 tabs, then the next started instance should restore 6 tabs. Or, if 1 of the 3 instances is still running, then 4 tabs get restored. I just tested with a blank setup and the latest build. I can reproduce that if I am very quickly closing HeidSQL, before the 10 seconds timer for storing the tab setup has reached its first end. So I think the call of MainForm.StoreTabs when closing HeidiSQL is not fired for some reason. Next nightly build should work stable with multiple HeidiSQL instances, each of them managing its own tab setup, writing to the same tabs.ini file. Tabs get restored if no other running instance is using them. Any more issues here? Please report if you find one. What an awesome improvement to my day-to-day work! Thanks for taking the time to implement this! I am closing this issue now, as there are no complaints for some days, and I can also find nothing to change. Please shout if you find more issues.